Now-a-days, almost every specialty area of dentistry is utilizing the powers of laser energy for therapeutic purposes. The diode laser is the most popular soft tissue laser and commonly used in dentistry. A diode laser with wavelengths ranging from 810 to 980 nm in a continuous or pulsed mode is used as a possible instrument for soft tissue surgery in the oral cavity. The 810 nm devices predominate in dentistry, whereas 810 nm is specific for hemoglobin absorption. Diode lasers have many advantages over traditional surgical and therapeutic techniques in addition to providing bloodless surgical and postsurgical course with minimal swelling, scarring, and others things noted are less pain, excellent hemostasis, rapid wound healing and bactericidal action with the minimally invasive procedure. 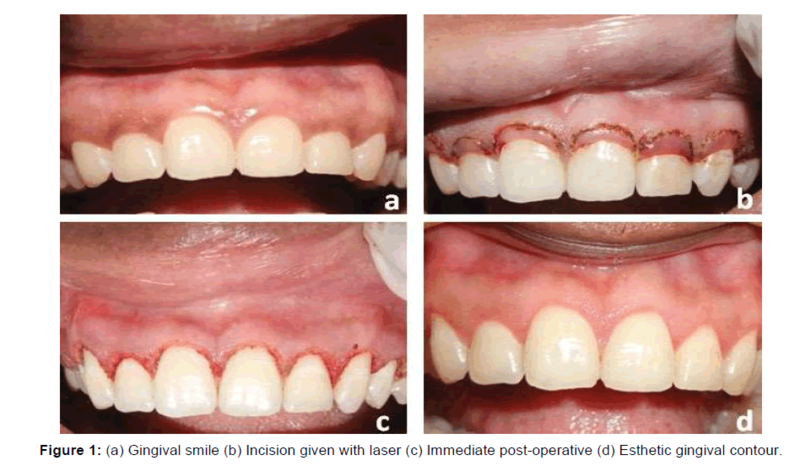 In the present paper, we discuss various uses of the diode laser such as esthetic crown lengthening procedure, excisional biopsy of pyogenic granuloma and gingival pigmentation in dentistry. Laser is an acronym for “Light Amplification by Stimulated Emission of Radiation.” Laser is a Monochromatic, uni-directional and coherent beam of radiation that is produced by stimulated emission, a state where there are more excited atoms (i.e., more atoms in upper of two energy levels than in lower level), a condition called population inversion to obtain a radiation output greater than the incident radiation. Many lasers with different active media were introduced since the advent of Maiman’s ruby laser. [1,2] Diode lasers are most commonly used lasers in dentistry for soft tissue procedures. The aim of this paper is to highlight the various uses of diode lasers in periodontal surgical procedures. A 26-year-old male patient was presented with a chief complaint of gummy smile. [Figure 1a] On examination there was compromised smile esthetics because of excessive gingival display on smiling, the smile line was standard, and there is no vertical maxillary excess. The patient is systemically healthy and is not under any medication. A diagnosis of altered passive eruption type 1 sub-group A was made after periodontal examination according to Coslet et al. Esthetic crown lengthening using diode lasers were done using the following settings [Figures 1b, 1c and 1d]. Figure 1: (a) Gingival smile (b) Incision given with laser (c) Immediate post-operative (d) Esthetic gingival contour. An 18-year-old female patient was reported with a chief complaint of dark gums in both the jaws. [Figure 2a] On examination gingival pigmentation was displayed while smiling. Dummett–Gupta Oral Pigmentation Index (DOPI): Dummett  score was three which is moderate gingival pigmentation. Laser depigmentation was carried out for both maxillary and mandibular arches using the following settings [Figures 2b, 2c and 2d]. Figure 2: (a) Dummett’s class II gingival pigmentation (b) depigmentation using a laser (c) Immediate post-operative (d) 6 months follow-up showing esthetic gingival color. A 29-year-old female patient reported with a chief complaint of swollen gums in the lower front tooth region, the lesion gradually increased in size throughout three months and said occasional bleeding while brushing. [Figures 3a] The patient was systemically healthy and was not using any drugs. Intraoral examination revealed a solitary, sessile lobulated gingival overgrowth extending on lingual surfaces of 42 and 43. It was reddish pink in color with white patches and was approximately 20 mm × 11 mm in size. Oval in shape with overlying surface was smooth. Radiographs like intraoral periapical radiograph showed no abnormalities, and a provisional diagnosis of pyogenic granuloma was made with a differential diagnosis of fibroma, peripheral ossifying fibroma, peripheral giant cell granuloma, and hemangioma. Excision was done using a laser, and the following settings were used [Figures 3b, 3c, and 3d]. Figure 3: (a) Pyogenic granuloma (b) Excision using the laser (c) Immediate post-operative (d) Two weeks post-operative. Continuous wave (CW) vs. pulsed. Several studies at that time showed that continuous wave mode at 1W power was enough to reach a bactericidal effect on roots, root canals, and implant surfaces. [16,17,21] Application of 3 to 4 W in continuous modeled very fast to carbonization of the soft tissue which causes higher absorption followed by heavy thermal damage and necrosis of the tissue. To approach better results in soft tissue treatment without much carbonization, it was necessary to interrupt the CW mode. That was done by chopping the CW mode. Pulses down to several 100 μsec were utilized. Although there is an ongoing debate over the efficiency and costbenefit ratios of using lasers, there are substantial benefits of using a laser especially a diode laser such as reduced pain, hemostasis, and improved patient comfort. Hence lasers may be considered as a boon rather than bane for the dentistry. Hitz CB, Ewing JJ, Hecht J. Introduction to laser technology. 4th ed. Hoboken, N.J: Wiley-IEEE Press; 2012;23-25. Maiman TH. Stimulated optical radiation in ruby lasers. Nature. 1960;187:493. Coslet JG, Vanarsdall R, Weisgold A. Diagnosis and classification of delayed passive eruption of the dentogingival junction in the adult. Alpha Omegan 1977;70:24-28. Dummett CO, Barens G. Oromucosal pigmentation: An updated literary review. J Periodontol 1971;42:726-736. Schwarz F, Aoki A, Sculean A, Becker J. The impact of laser application on periodontal and peri-implant wound healing. Periodontol 2000 2009;51:79-108. Aoki A, Mizutani K, Schwarz F, Sculean A, Yukna RA, Takasaki AA, et al. Periodontal and peri-implant wound healing following laser therapy. Periodontol 2000 2015;68:217-269. Jin JY, Lee SH, Yoon HJ. A comparative study of wound healing following incision with a scalpel, diode laser or Er, Cr: YSGG laser in guinea pig oral mucosa: A histological and immuno-histochemical analysis. Acta Odontol Scand 2010;68:232-238. Pereira AN, De Eduardo C P, Matson E, Marques MM. Effect of low-power laser irradiation on cell growth and procollagen synthesis of cultured fibroblasts. Lasers Surg Med 2002;31:263-267. 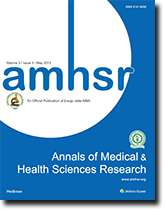 Hawkins D, Abrahamse H. Effect of multiple exposures of low-level laser therapy on the cellular responses of wounded human skin fibroblasts. Photomed Laser Surg 2006;24:705-714. Alexandratou E, Yova D, Handris P, Kletsas D, Loukas S. Human fibroblast alterations induced by low power laser irradiation at the single cell level using confocal microscopy. Photochem Photobiol Sci Off J Eur Photochem Assoc Eur Soc Photobiol 2002;1:547-552. Silveira PCL, Streck EL, Pinho RA. Evaluation of mitochondrial respiratory chain activity in wound healing by low-level laser therapy. J Photochem Photobiol B 2007;86:279-282. Marques MM, Pereira AN, Fujihara NA, Nogueira FN, Eduardo CP. Effect of low-power laser irradiation on protein synthesis and ultrastructure of human gingival fibroblasts. Lasers Surg Med 2004;34:260-265. Romanos GE, Henze M, Banihashemi S, Parsanejad HR, Winckler J, Nentwig G-H. Removal of epithelium in periodontal pockets following diode (980 nm) laser application in the animal model: An in vitro study. Photomed Laser Surg 2004;22:177-183. American Academy of Periodontology Statement on the Efficacy of Lasers in the Non-Surgical Treatment of Inflammatory Periodontal Disease. J Periodontol 2011;82:513-514. Moritz A, Gutknecht N, Doertbudak O, Goharkhay K, Schoop U, Schauer P, et al. Bacterial reduction in periodontal pockets through irradiation with a diode laser: a pilot study. J Clin Laser Med Surg 1997;15:33-37. Moritz A, Gutknecht N, Goharkhay K, Schoop U, Wernisch J, Sperr W. In vitro irradiation of infected root canals with a diode laser: results of microbiologic, infrared spectrometric, and stain penetration examinations. Quintessence Int Berl Ger 1985 1997;28:205-209. Hilgers JJ, Tracey SG. Clinical uses of diode lasers in orthodontics. J Clin Orthod JCO 2004;38:266-273. Yu DY, Chen HC, Chang SY, Hsiao YC, Chang CJ. Comparing the Effectiveness of 1064 vs. 810 nm Wavelength Endovascular Laser for Chronic Venous Insufficiency (Varicose Veins). Laser Ther 2013;22:247-253. Graeber JJ. Diode Lasers: A Primer. www.dentalacademyofce.com/courses/2564/PDF/1401ceiGraeber_rev3.pdf. Gutknecht N, Van Gogswaardt D, Conrads G, Apel C, Schubert C, Lampert F. Diode laser radiation and its bactericidal effect in root canal wall dentin. J Clin Laser Med Surg 2000;18:57-60.